As we’re getting ready for Easter, we all employ some sort of visual communications to pass on our greetings to clients, business partners, work colleagues or family members. Whether by sending out cards and emails or by posting photos on social networks, we rely on images to help us convey our thoughts. Just like cards and emails, digital signage allows you to transmit a message employing visual aids. But its greatest strength doesn’t reside in the support of visual information only but in its adaptability to particular events, such as Easter. So unlike cards and emails, one single digital sign can be re-used again and again, for different purposes. – Promote your Easter-themed corporate events. Ok, you have already sent everyone an email inviting them to the party but you do realise that people often forget about emails in the busyness of the day or they press delete without even opening them if these happen to arrive at the wrong time. Posting your Easter event on a screen, complemented by eye-catching imagery, ensures that all those targeted will know about it. Do you have videos or images from last years’ similar events? Integrate them into your communications to show how the event is going to be like and increase attendance rates. After all, the more, the merrier. – Brighten up your offices. If your digital displays don’t do so during the year (though they should), at Easter you should use them to create a festive atmosphere. 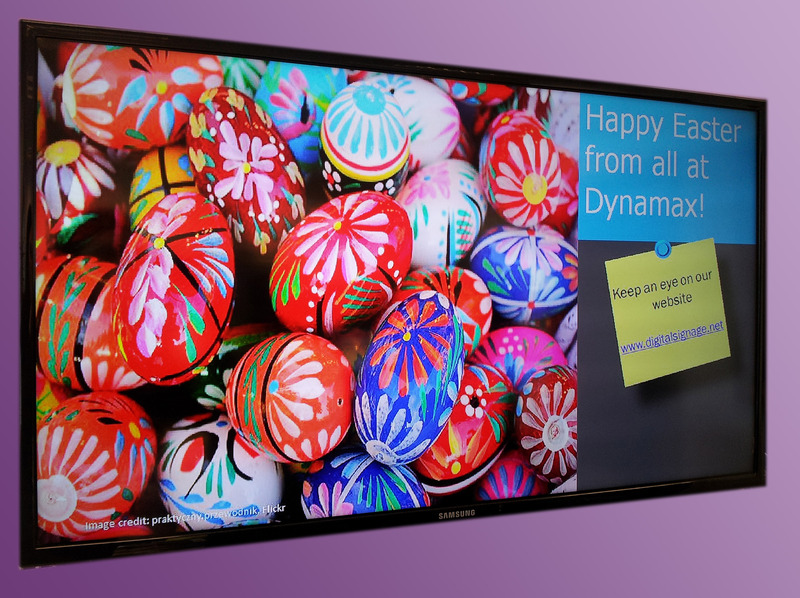 The use of digital signage represents an easy way to wish everyone a Happy Easter, a gesture that costs you nothing yet it shows that you care. You can argue that your employees are as important as your customers, so make sure they feel valued at work. – If your company is launching special promotions around Easter, you want your staff to be the first to know. Not only will they make use of the offer (especially if they enjoy additional discounts) but they will also pass on the news to friends and relatives. By advertising your promotions on screens in your offices, you will ensure that staff, regardless of department, will know about them first hand. – Advertise your Easter-related products, of course. These would already be in high demand as the holiday approaches so share details about where and how they can be bought. 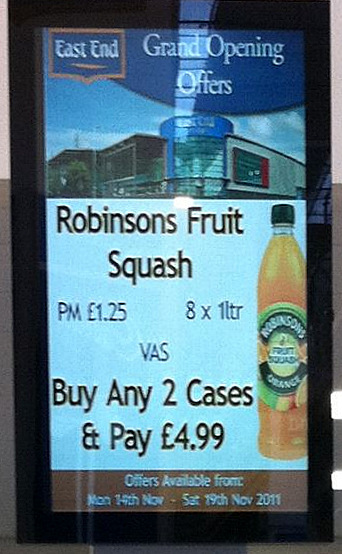 If you have a digital advertising screen in other locations like shops or stores for example then you will be able to reach your customers too with topical communications such as these. And when you think that you can adapt and post new messages whenever needed, according to sales targets, weather or available stock then you see why digital signage is such a powerful fool. Easter is a great time to give a human dimension to your corporate communications. digitalsignage.NET, our digital signage software allows you to combine heartfelt greetings with targeted promotions by helping you deliver your communications to the right place, to right people, at the right time. Find out more by requesting a free, no-obligation consultation or by watching our webinar. 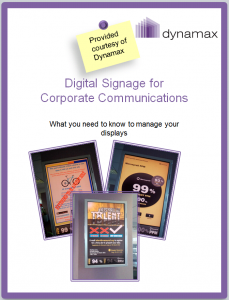 If you want to learn more about the use of digital signage for corporate communications, download our white paper. Last but not least, Happy Easter to you all! We hope you’ll have a good break! 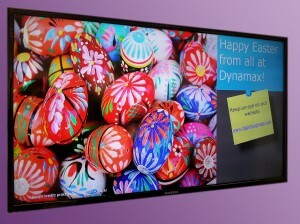 This entry was posted in Digital Signage, Tips and advice and tagged corporate digital signage by Dynamax. Bookmark the permalink.